Professional portrait photographers swear by their expensive wireless shutter triggers - those little remote gadgets that let them take photos while waiving a stuffed bear at a toddler. 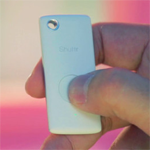 Now someone is trying to bring the same functionality to smartphones with the oddly-named Muku Shuttr, a tiny Bluetooth remote that lets you snap photos without holding your smartphone. It's a novel idea, and the Kickstarter campaign has already passed its modest $10,000 goal with more than three weeks left. The device itself is incredibly simple: just a button and a keychain hole. Start the camera app on your phone (front or rear-facing camera, it doesn't matter), position the phone, press the button, and you've got your photo. Compatibility seems to be a bit hit-or-miss: all the recent iOS devices are supported without an addition app, as are the Samsung Galaxy S4, SIII, Note II, 8.0, and 10.1, and the Nexus 4. 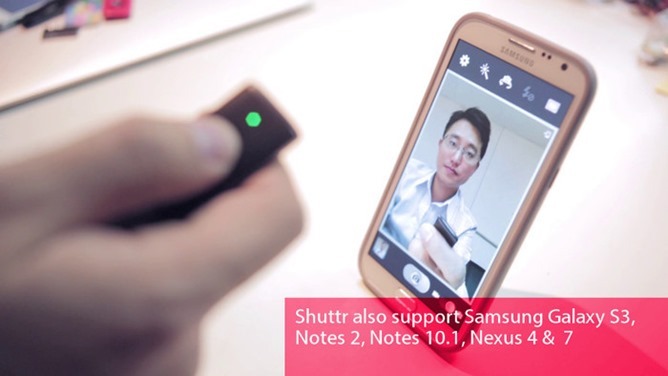 According to the description on Kickstarter, a separate app enables the use of the Muku Shuttr on the HTC One, One X+, and the Sony Xperia S and Xperia Z. Other Android phones are explicitly not supported: "We do NOT recommend other Android phone which is not mentioned above." That seems a bit strange - surely if the Nexus 4 works without an app, other AOSP phones would be OK as well? The campaign reached its goal in under a week. Pledge goals that include hardware (plus a suction cup kickstand) start at $29, and the earliest deliveries are scheduled for October... but I wouldn't hold my breath, considering how Kickstarter deliveries tend to slip. (I'm still waiting on Star Command, you jerks.) Also, a bit of warning: the English on the Kickstarter page is pretty rough. [Weekend Poll] Do You Still Believe A microSD Card Slot Is Necessary In Your Smartphone?